After beating blown out 42-17 by the Denver Broncos, the Dallas Cowboys have heard plenty of chatter, none more than Dez Bryant. It’s all noise. On paper, it seemed like it was a rough outing for Dez Bryant against the Denver Broncos on Sunday. He saw 16 targets against the Broncos’ vaunted secondary and was only able to reel in seven of those targets for 59 yards a touchdown. But it got worse as both of Prescott’s interceptions were when he targeted Bryant and one came directly off of his hands and into Chris Harris Jr’s arms. For whatever reason, the instant outrage from the fans and the media was to call the Cowboys’ No.1 receiver a bust or a bum after the team was beaten 42-17 in Mile High. The question that was asked the most frequently over the past few days was if Bryant can ever become an elite receiver again. And the answer is simple; he still is. 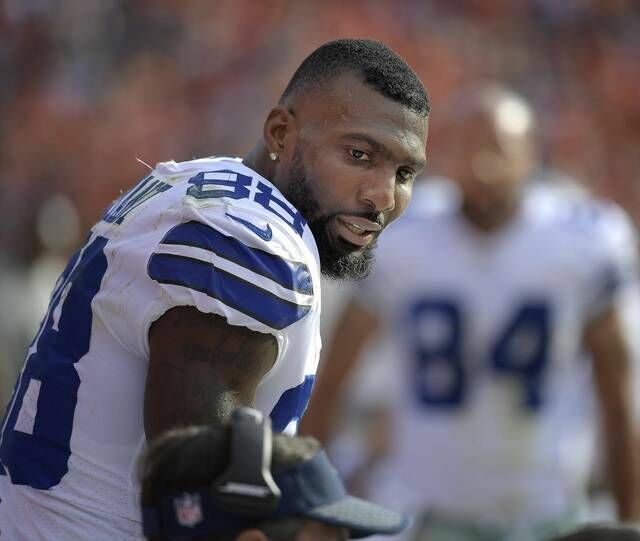 Why should Cowboys’ fans stay optimistic about Bryant and not panic? Well, there are a variety of reasons. First and foremost, it takes time for a receiver to get used to a new quarterback and that’s true for even the great ones. In 1990, Jerry Rice caught 100 passes for over 1,500 yards with Joe Montana as his quarterback. But in 1991 and 1992, Rice saw his yardage drop by 300 yards in each season and his catch totals dropped by about 20 percent with Steve Young now at the helm. Does that mean Rice, at age 29, suddenly became a worse player or that Young was a terrible quarterback? Of course not. There are many other examples of receivers taking awhile to bond with their new quarterback. If you are lucky enough to stick around long enough, you’ll likely play with multiple quarterbacks. Such as is life as an elite receiver in the NFL. For Bryant, Sunday was just his 16th game (including the playoffs) in which he played with Prescott. And that number is even smaller when you consider that Bryant only played in one drive in the final regular season game of the season. Bryant and Prescott just haven’t had the same amount of time together as a Jordy Nelson and Aaron Rodgers or as Antonio Brown and Ben Roethlisberger. It’s going to take them some time to learn how to play with one another. However, it’s not like the two has struggled together during their time on the field. In those 16 games, Bryant has gone over 1,000 receiving yards and has scored a total of 12 touchdowns despite consistently getting opponent’s top cornerback. Which leads to my next point; Dallas has faced two of the best passing defenses in the league so far. We all knew heading into the season that the first three games of the season were going to be tough for Bryant because of the likely receiver-cornerback matchups. We shouldn’t be surprised that the duo has struggled to get on the same page so far given how great their opponents have been.